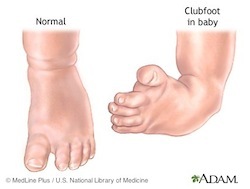 Club foot is a physical deformity that develops in-utero. About one in 1,000 births are affected by the birth defect. Male children are slightly more prone to the condition than female children. Other risk factors include a family history of club foot or smoking while pregnant. Women who smoke during pregnancy and have a family history of club foot may be 20 times more likely to have a child with club foot. Club foot present as an in-turn of one foot or both feet. The condition can be diagnosed in-utero via ultrasound or at birth. Visual identification of club foot is all that is needed for diagnosis. There are two treatments currently used to treat club foot – the Ponseti Method and surgery. The Ponseti Method involves casting the affected leg(s) starting in early infancy. The casts are designed to gently push the foot back to normal position. Casts are changed weekly for the first phase of treatment. When the repositioning is complete (between four to eight weeks after the start of the casting phase) the Achilles tendon may be cut to relieve tension and reduce the risk of rebound. The final cast is placed on the foot and leg where it stays for about three weeks. After the Ponseti Method repositions the foot, a brace of splint is worn daily for about four months and nightly for up to four years. Surgery is a more drastic means of repairing club foot. Surgery can be performed between three months and one year of age. Tendons are lengthened during surgery to allow the foot to return to normal position. Braces are worn to hold the foot in place for up to seven years. Surgery can be repeated if the condition returns. If club foot is detected during a pregnancy ultrasound, you may want to speak with the pediatrician who will be caring for your infant after birth about the condition. Early treatment can prevent the need for surgery. Club foot does not reduce life expectancy. With proper treatment and follow-up care, patients live normal lives with few to no symptoms.